Forums » General Discussion » Advice from Axiom Owners » Update the grills? #412033 - 05/08/15 01:56 PM Update the grills? If I could give any cosmetic advice to Axiom for future designs....change your grills. I am nit picking here as the speakers are attractive of course, but they stick out too far. Too thick. Especially on things like the on walls. 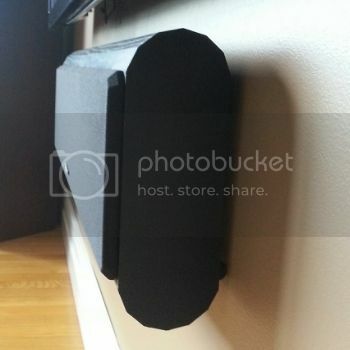 Speaker Grills, screens, covers what ever you call them, should be flush with the cabinet, not stick off of it like a zit. Sure in the 80's this was the norm but when I see a speaker with a grill that's flush and almost hidden AND has magnets....it is just that extra nice touch. Of course thinner can also be flimsy so there's a trade off. Hmm, interesting, I would think though, that would depend on the color. I have a set of high gloss black and I barely notice the grills. I gather, in order to accomodate what you are suggesting, a slight change in cabinet design would be in order in that there would have to be a slight extension out the front of the cabinet on each side matching the thickness of the grill. I wonder what Ian would have to say about this, in terms of cost and how it may affect, if at all, the current sound design of the speaker? I would imagine extending the cabinet would have adverse effects on the audio, due to boundary effects blah de blah blah. why not just make the grill wider and taller so that it covers the whole front of the speaker and eliminates the outer reveal. That way the front of the speaker would be totally flat with the grill on. My beef is with the design of the M100 and LFR1100 grill. I hate the 3 piece on an angle. they are forever looking wrong as they tend to be out of alignment. I would be more happy with a single long one piece grill. I don't need to have part of the speaker exposed and other parts covered. [quote=oakvillematt]why not just make the grill wider and taller so that it covers the whole front of the speaker and eliminates the outer reveal. That way the front of the speaker would be totally flat with the grill on. My beef is with the design of the M100 and LFR1100 grill. I hate the 3 piece on an angle. they are forever looking wrong as they tend to be out of alignment. " I have only seen pics of these grills and I agree they don't look rite! Even if they made the grill skinnier. I see how this would play out... They would just make the front face of the cabinet itself thicker vs. making the grill thinner or cutting into the current cabinet. You wouldn't gain any reduction in total thickness as that would interfere with the sound of the speakers. I think that flush grills work well for those of us that keep grills on, but then you have the people that don't use the grills, and it might look strange for them. Not a win-win situation for everyone, so probably won't change unless they DID just make the grill thinner. My beef is with the design of the M100 and LFR1100 grill. I hate the 3 piece on an angle. they are forever looking wrong as they tend to be out of alignment. I personally like the look, though I currently only have the grilles on my QS8s. If kids ever come over, however, I'll put the grilles on and appreciate that it doesn't look so boring with the one long rectangle. @oakvillematt - I agree about your comments on the 3 piece grill. I find it so ugly that I could never consider buying them. As the grills size go I don't really have any issues aside from the 3 piece. I do however wish the on walls looks a little more contemporary.